What I seek to resolve - once and for all - are any remaining sentiments of an either/or pedagogy. 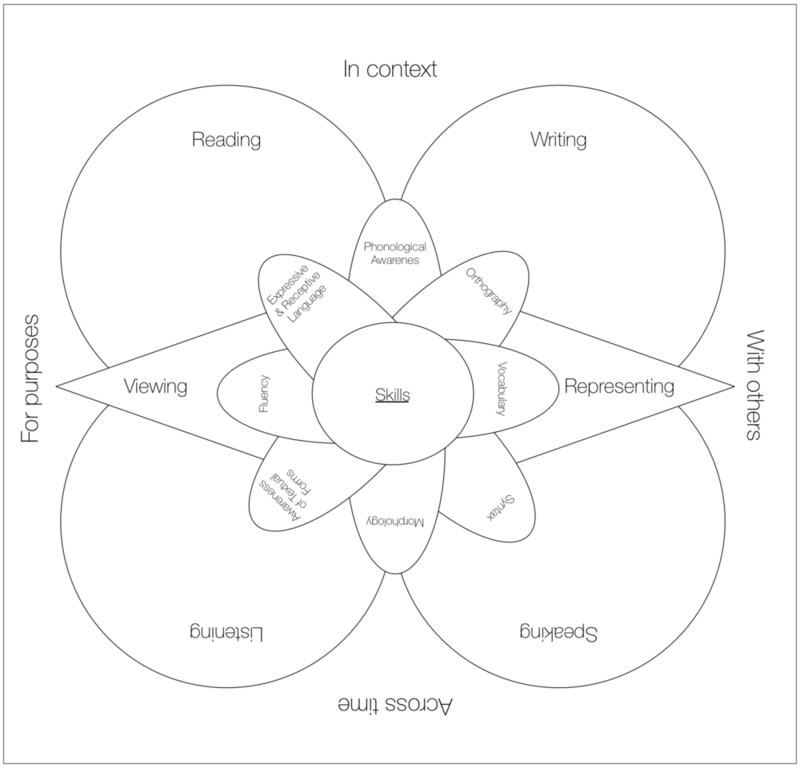 Whilst it is true that certain elements of literacy should be the focus of instruction at key stages (see Figure 1 & 2 to the right), arguments that contend that certain skills (e.g. phonemic awareness) should be developed to the exclusion of or prior to others (e.g. word meaning) are misinterpretations of the research. For instance, it is well documented that early years literacy should include clear, systematic practice in phonemic awareness, word recognition, fluency and spelling. However, the instruction at such a level must also involve the fostering of rich vocabulary knowledge and modelled textual practices for learners - particularly English language learners - to be prepared for the types of texts that will be encountered subsequent to Year 3 (Chall, Jacobs, & Baldwin, 1990; Morris et al, 2010). And by Year 7, teachers must be well equipped with a literacy pedagogy that provides scaffolded, meaningful and discursive practices with reading, talk, composition, disciplinary vocabulary and learning occurring in a range of genres and contexts, whilst continuing to develop learners' metalinguistic awareness (Chall, Jacobs, & Baldwin, 1990; Shanahan & Shanahan, 2008; Slavin et al, 2008; Goldman, 2012; International Reading Association, 2012). The teacher’s role is to arrange tasks and activities in such a way that students are developing (Verhoeven and Snow, 2001). The teacher - therefore - must be "aware of the learning intentions, [know] when a student is successful in attaining those intentions, [have] sufficient understanding of the students’ prior understanding as he or she comes to the task, and [know] enough about the content to provide meaningful and challenging experiences so that there is ... progressive development” (Hattie, 2012, pp. 19). The classroom and the whole school should promote "a coherent curriculum [that] helps students ... acquire basic skills as well as the strategies needed to tackle challenging tasks (Newmann, Smith, Allensworth & Bryk, 2001) As a controversial statement, I would like to contend that there is no stage when language and literacy become automatic. Instead, there are certain skills that become automatic (in which one becomes proficient), whilst there are other skills - often higher order skills - that must become areas of further attention. School factors - such as the school climate, available resources, quality staff and teachers' satisfaction/self-efficacy - can all enhance reading achievement (Chiu, et al, 2012). And access to quality education is also significant. Zhang et al (2013) cite how "in the United States only 55% of children between the age of 3 - 5 are enrolled in pre-school, whereas, in Bejing, over 82.3% of children between 3 - 5 attend some form of pre-school." (Zhang et al, 2013, pg 666). However, despite near universal pre-school in China, studies still suggest the importance of family SES in driving children's language and reading skills. (Zhang et al, 2013). Even though quality schooling can mitigate against the effects of poverty; by themselves schools are unable to foster reading achievement on their own. Factors in the home environment play an important role, and - therefore - home-school communication and collaboration are vital factors that can greatly enhance the opportunities being fostered in quality schooling environments (Chiu, et al, 2012). We find that parental socioeconomic status [SES] impacts upon a child’s early reading achievement as well as upon children's attitudes towards reading and their reading practices in the home. And parental SES is impacted by and also impacts the type of work and levels of education attained by the parents. Parental SES status also impacts the number of books found in the home, particularly the number of age-appropriate children's book, which comes to impact reading practices and reading attitudes, which - in turn - impacts reading achievement (Chiu, et al, 2012). Perhaps contentiously, I will argue that a particular home environment provides a better and more natural environment to illustrate how the multiple conceptions of literacy pedagogy can take shape (Heath, 1983). In some homes, it is not surprising for one to imagine how bedtime reading, alphabetic flashcard practice, scaffolded writing instruction and language-in-context practice can occur with only limited orchestration. The adult has a bedtime routine of rich reading of favourite books ( *building vocabulary* ), time set aside to play with enticing alphabetic games ( *enhancing word recognition* ), time to write a birthday card to grandma ( *modelling of genre conventions* ), and an emphasis on language in the act of - for instance - baking a cake ( *learning vocabulary connected to valued activity* ). Each activity emphasises different aspects of literacy development; however, each activity is integrated through the joint intentional activity of the adult & child. It is easy to see how "a highly verbal and emotionally stable family environment greatly benefits vocabulary and reading." (Zhang et al, 2013, p. 665) "[The family environment] effects operate indirectly through increased amounts of child–directed speech, richer vocabularies, and literacy–related strategies in daily communication in higher SES families, and thereby contribute to how [socioeconomic status] gets into the brain and onto the page to affect children's reading skills." (Zhang et al, 2013, p. 669) It is also significant to note how "the home literacy model (Senechal, 2006) suggests that those activities in which parents engage specifically to teach word recognition and writing skills tend to facilitate early literacy skills in children, whereas storybook reading, which is a more informal literacy experience, may not directly facilitate subsequent reading skills," though they are known to facilitate vocabulary growth and comprehension skills (Chiu, et al, 2012, p. 392). It is well documented that "early literacy skills tend to be strongly related to subsequent literacy skills across cultures," and that "early phonological and vocabulary abilities were found to mediate the [socioeconimic status] effect on ... children's reading achievement by the end of third grade. Furthermore, both phonology and vocabulary at preschool ages, although correlated, were found to exert equally strong and additive mediation facts." Therefore, "early vocabulary is as strong a mediator as phonology." (Zhang, et al, 2013, p. 669). The learner must be "a biologically and socially adept human being ... susceptible to training ... [with] fundamental trust [in] the authority of the teacher ... [engaged in] socio-linguistic interaction ... transmissible ... through enculturation" (Moyal-Sharrock, 2010, pg 6 - 7). One's opportunity to learn can be decreased if the learning environments have limited resources, large class sizes, substantial health and safety risks, inadequate teacher education, insufficient special needs programs, and high levels of inequity within the community and classroom. A high level of language diversity can also hamper learning, particularly if students from minority language groups are asked to learn in an additional language without proper support in the new language or maintenance of their mother tongue (Roskos, et al, 2009). Substantial opportunities to practice and key opportunities to turn such practice into success (e.g. jobs, clubs, etc). The teacher must be able to recognise these features and take them into account when assessing the suitability of the goals for instruction, of the instructional materials, of the instructional methods, of classroom/instructional management, of community and parental engagement, of the role of home language and multilingualism, and of the forms of the assessment to be used (Au, 1998; Au & Mason, 1981). A teacher's expertise should be both technical and socio-cultural. The above is easier said than done, and even Chall, Jacobs and Baldwin (1990) acknowledge that the strongest characteristic of classroom learning is the structure (or time allotted) in the classroom. When the structure lacks balance, then it is difficult to consolidate skills and to integrate practices. Chall's colleague Catherine Snow equally acknowledges the importance of effective home practices and emotional support if children are to continue on the pathway to being resilient, motivated and successful learners (Snow et al, 1991). And in the busy life of teachers, children, youth and adults, it is essential that physical and temporal space is carved out for real, effective, consolidated development of literacy (Bartlett & Holland, 2002). When conditions (including policy) allows for such spaces to be allocated for cohesive learning, then deep discourses can be fostered with sufficient time to develop skills and expertise (Gebhard, 2005). When conditions work against one, it may feel like one is trying to swim upstream (Gebhard, 2002). Shanahan, T., & Shanahan, C. (2008). Teaching Disciplinary Literacy to Adolescents: Rethinking Content- Area Literacy. Harvard Educational Review, 78(1), 40–60.